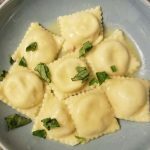 I’m attempting to make one thing that challenges me every week, and I kicked the year off with ravioli. Making pasta from scatch was something that had long interested me, but seemed too difficult to take on. Not true! I’ve come to realize it’s really this simple: 1 egg + 1 cup of flour = 1 serving. If you can get that combined right, have the patience to let it rest, and have a big of elbow grease, you can have pasta within an hour. In this case I had some leftover pizza toppings that I thought might combine into something worthwhile – some cooked and crumbled Italian sausage and some homemade ricotta cheese, with a touch of salt and herbs. 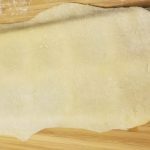 The full recipe is below but the gist was as simple as rolling out the noodle (thinner than you think as you’re doing it), filling, covering, rolling again, and cooking. And fresh pasta takes no time to cook at all. In the pan with some melted butter and a splash of pasta water created a very tasty, and otherwise simple ravioli. Would I do it again? Heck yeah. Now to break out the sheeter and make some actual noodles. 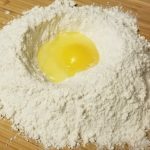 Homemade pasta isn't about complex ingredients, it's about attention to detail and technique. In fact, all you need is one egg and one cup of flour for each person you want to feed. With the right effort, pasta will come out the other side. What you fill it with is up to you - here, I used leftover Italian sausage and homemade ricotta. Because homemade ravioli goes best with leftovers. Waste not, want not! Place the flour in a pile on a cutting board and create a well in the middle. Crack the eggs in the well, and using a fork, gently whisk the flour and eggs, gradually pulling flour in to the eggs. Lightly flour a new board - or clean and dry your current one - and overturn the blended flour and eggs on to it. Gently knead about 10 minutes until it becomes consistent in colour and texture. Don't be afraid to add a bit of water if the mix is too crumbly. Once complete set the dough on a clean surface, cover with a bowl, and leave to sit for 30 minutes. 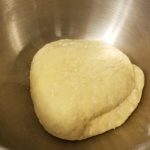 After 30 minutes lightly flour a new surface, pull off an egg-sized ball of dough, and begin rolling it out. Turn a quarter turn consistently as your roll. You're done when you can see your hand through it. Most people leave it too thick, so be sure it's thin enough to read a magazine through! 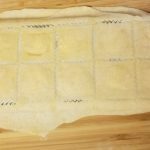 Lay the dough over a ravioli mold and lightly press into place. Fill with your selected filling (in this case, cooked Italian sausage and ricotta). 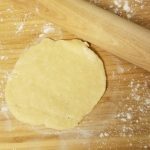 Place another layer of dough on top, then using your rolling pin, roll over top until it both seals and cuts. 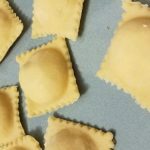 Remove the ravioli and carefully remove any loose edges or hangers-on until you have complete, perfect little squares. Place in salted, boiling water. Have a pan with melted, unsalted butter at the ready - fresh egg pasta cooks in well under a minute. Once it rises to the surface of the boiling water remove with a slotted spoon and place in the buttered pan. Add a touch of the salted pasta water, toss, and serve. Just because I’m all into the cooking and stuff I thought I’d try to keep track of some of the things I come up with for dinner. You can give them a shot at home, although I imagine combinations like tonight’s will be a bit too odd for most. I’ve long wanted to attempt a mole sauce, which is often referred to as a Mexican chocolate sauce. While it does indeed contain chocolate the amount is small and the sauce certainly doesn’t taste like chocolate. The combination of hot peppers and chocolate is not as odd as you might think, and in fact is quite popular and has been for a very long time. With that in mind I wanted to come up with a chocolate and pepper sweet sauce for pork chops, and set out to do so tonight. The sauce was made up of about 500 grams of dark chocolate I used a double boiler to melt and then added to the pureed and strained contents of one prickly pear cactus. I then roasted a poblano pepper, seeded and peeled it, and then pureed the mixture and pepper together with two tablespoons of ancho chili powder, some lime zest, and a bit of salt and cracked pepper. This was placed on top of a pork chop that had been essentially baked in a pot of butter, grapeseed oil, and garlic, followed by onions, and after they were soft, diced plum tomatoes. They were topped with two cups of chicken stock and the juice of a lime before the pork was added and then cooked until well done. The pork chop came out very good, and the sauce was amazing but needs to be offered in a smaller quantity. It got me thinking of perhaps making a pork or chicken dish with three small sauce sides such as this one, a green sauce made with tomatillos and garlic, and something else I haven’t even thought about yet. If there’s one thing I’ve noticed about working for yourself, it’s that holidays mean nothing. I remember looking forward to long weekends so much, and doing absolutely nothing when they got here. Now here it is, almost a full year and I haven’t enjoyed a long weekend yet. It’s just work, work, work. I look forward to the day when I can look forward to a Monday off again. In the meantime, I took advantage of a night alone to get crazy in the kitchen again. It started when Mar alerted me that my Tomatillos were ready to be pulled, and indeed they were bursting out of their husks. I can’t believe I managed to grow them here in Canada. My cayenne chili peppers were ready to go as well so I plucked one cayenne and three tomatillos. I marinated some steak in lime juice, habanero sauce, chili powder, and coriander for a few hours, then grilled it and sliced it in strips. I served’em with chopped endive, sliced tomatillo, and crumbled blue cheese in warmed flour tortillas. I also made the famous Mexican “green sauce”, which is basically garlic, chili peppers, tomatillo, and onion roasted in olive oil, then blended with cilantro into a sauce. It all turned out really good – and in less than two weeks I’ll be trying this stuff in a classroom for four hours a night.. wow. 1. What’s your favourite piece of clothing that you currently own? 2. What piece of clothing do you most want to acquire? Hrm.. does this count as clothing? Because I would SO love one of them. But it’s got to say WWF, not WWE. 3. What piece of clothing can you not bring yourself to get rid of? I have a series of hockey jerseys that no longer fit me from when I was a kid, but I’d never get rid of them. Team Canada, the Sharks, the Lightning, two Blackhawks, and a Sabres. 4. What piece of clothing do you look your best in? Well, if you ask my wife, anything with a shirt and tie. Basically, anything blue tends to get the most reaction because my eyes are so bright blue. 5. What has been your biggest fashion accident? Shake together, serve in a salt-rimmed glass. Who would have known the inside of a prickly pear cactus was red? The white tequila ensures that the colour of the cactus shines through, and of course, you hand someone a drink like this they’re expecting strawberry, not a kick-ace margarita. It’s REALLY nice, I hereby suggest everyone try it. A question for y’all – because I now like this I want to try prickly pear cactus in other things – but, they’re seasonal. If I buy a bunch, puree them up, and then freeze them – is this good? Will they keep until next summer frozen? I’m off to drink this thing in front of the telly and relax for the night with a DVD viewing of “Crossroads” starring Britney Spears. Normally I wouldn’t have told you this, it must be the cactus talking….